The Neighborhood Anarchist Collective (NAC) strives to grow the anarchist movement through strategic direct action and by providing a welcoming environment for education and participation. 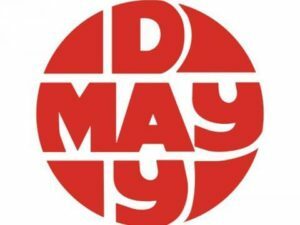 We organize locally in Eugene Oregon to help build a society where neighbors support each other to meet basic needs, individuals are free to follow their passions, and empowered communities collectively shape the future. There are almost as many perspectives and beliefs as there are people in this movement. We’ve collected some resources for you to begin exploring the terms and concepts of anarchism. Continue your self-education by unpacking the harmful behaviors and language patterns that we all learn from the society we are raised in. Empower yourself; educate yourself and remember to question everything! 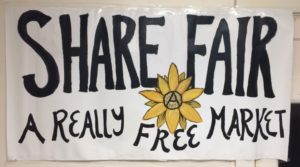 The Share Fair is a monthly event to connect people with resources, services, and each other in a convenient and fun way. Food, clothes, haircuts, massages, bike repair, helpful organizations, music, and more – all absolutely free! Join us at the next Public Gathering! Curious about anarchism? Want to be involved in projects that benefit your community and enrich your life? You’re invited to the Neighborhood Anarchist Collective Public Gathering! We’ll explain the purpose of NAC, demonstrate how we work together, explore how we’re organized, and provide new members with the tools they need to plug in! Join us to learn about actions, projects, and how to get involved! NAC welcomes everyone. Our meetings are ADA accessible. If you have any questions or accessibility needs please feel free to contact us. Check the events below for the location and details.